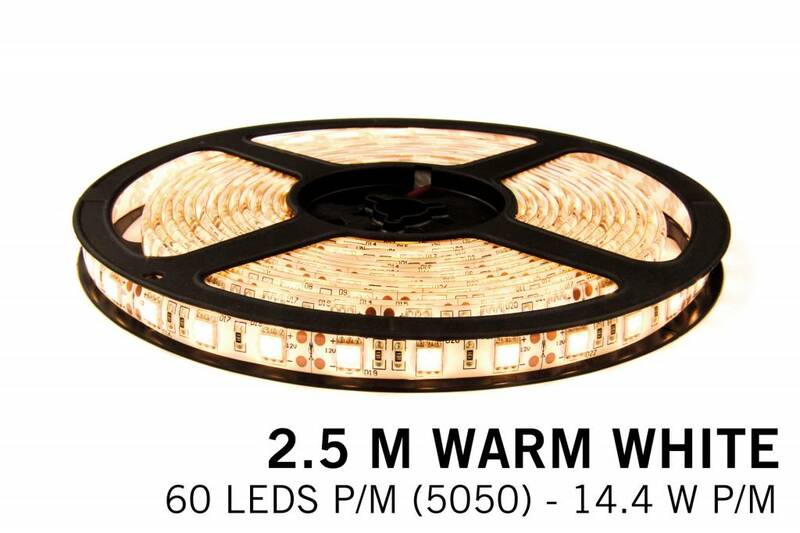 Warm White (WW) 2,5 meter LED strip with 150 super bright LEDs type 5050 LEDs. 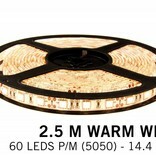 This LED strip with a color temperature smilair to that of a bright tungsten light bulb, can be used as main lighting. The warm white color and good color rendering properties, makes this warm white LED strip a decorative and functional addition to your interiour. This bright multi-purpose ribbon light contains Class A type 5050 LED's. It can be used for many different creative light designs and but thanks to its splash proof coating, its also very suitable as a light source under kitchen cabinets or in the bathroom. • 2,5 meter LED strip with 150 warm white LED's, 60 type 5050 LED's p.m.